Standing prominently around the town of Albany for over 100 years, Fort Frederick kept the peace over the culturally diverse town during its most precarious years, before becoming the symbol of Patriot Resistance. Fort Frederich once stood as an emblem of British dominance over the colonies of the New World. The fort, named after King George the Second’s son Frederick Louis, was constructed in 1676 shortly after the takeover of the colony of New York by the British from the Dutch. The fort was replacing the dutch Fort Orange and was constructed under the Duke of York as a literal and figurative symbol of British dominance over the city. A simple fort consisting of merely a barricade and two small buildings, it was meant in all forms to keep the peace over the largely dutch majority. It also was created as barrier to the frontier, especially to the west of Albany, where hostile natives were likely to attack. As the frontier expanded and Albany no longer was its edge, the fort slowly began to lose importance. Nevertheless It was rebuilt starting in 1702 from the tradition barricade to a masonic fortification. It was heavily upgraded with 21 canons and a barricade that surrounded the entire village of Albany. The new fort was created to protect Albany from the possibility of French and Indian attack. It gained its greatest use during the French and Indian war, or the Seven Years War were it was used a major British base of operations. It was further upgraded with a hospital, barracks and storehouses being added to the fort. It was this time that the largest number of soldiers used the fort. Soon after the war though, the fort began to fall into disrepair, being used by the citizens of Albany. Much the fort was salvaged by the citizens to construct new buildings in the city. The American Revolution revived the Fort to a place of importance for the final time. Still seen by the British as a symbol of dominance over the area, the fort was the main target of General Burgoyne during his infamous three pronged attack on Albany. His goal was to take the fort, hold Albany and split the 13 colonies in half. Therefore the rebellious New England Colonies were cut off, making them easier to conquer. So here the Fort, once the emblem of British dominance, had now become the emblem of American Resistance. His plan failed, and throughout the war the fort was used by patriots as a prison to house British and tory POWs. That would be the fort’s last great use though as soon after in 1789, the fort was officially torn down. "Fort Frederick." Fort Frederick. Accessed March 25, 2016. http://dmna.ny.gov/forts/fortsE_L/frederickFort.htm. 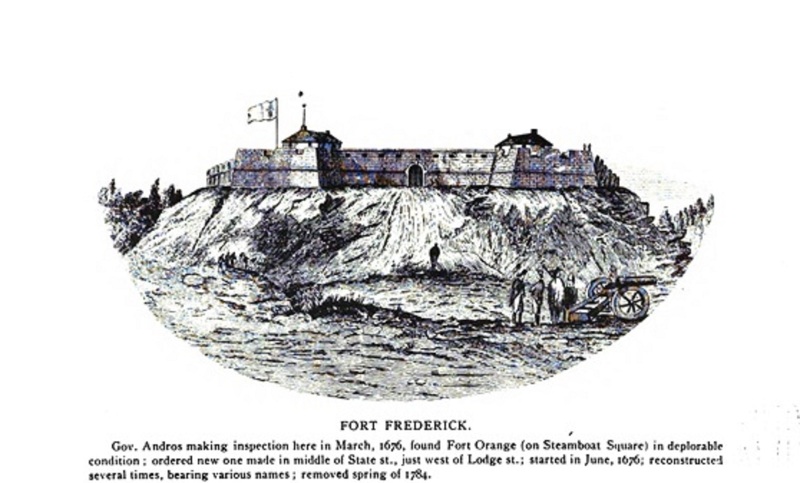 "Fort Frederick (Albany)." Wikipedia. Accessed March 29, 2016. https://en.wikipedia.org/wiki/Fort_Frederick_(Albany). Ben Sano, “Fort Frederick Marker,” Albany Walks for Health, accessed April 20, 2019, http://www.albanywalksforhealth.com/items/show/48.